If the Star Wars Rebels season 4 Blu-ray was only 15 minutes long, it would still be worth the purchase. That’s because the release (which has about seven hours of content, don’t worry) includes an incredible 15-minute featurette called “Forces of Rebellion,” which is just series executive producer Dave Filoni talking about the Force. And it’s wonderful. A discussion like that might sound boring to some, but anyone who has listened or talked to Filoni knows he’s probably more knowledgeable and passionate about Star Wars than anyone in the world, including his mentor, George Lucas. So when he sits down and talks about how he wanted to represent this cornerstone of Star Wars on his Disney XD animated series, it’s hard not to marvel at the experience. Much of what Filoni talks about may already be familiar to longtime fans, but the way the piece is produced—linking the show to the movies and more—really works. Also, Star Wars fandom is so messed up right now, Filoni’s words really do hammer home what’s true and wise about Star Wars. He goes over how the light side is about those who use their powers to help others, never themselves. How the dark side is a vicious circle, because the more you use the powers selfishly, the more you have to use them in order to keep that power. And throughout, this idea is illustrated not just through the lead character on Rebels, Ezra, but also Luke Skywalker, Anakin Skywalker, and even Ben Solo from the sequel trilogy. Filoni also discusses how he leaned heavily on animals in Rebels to represent the living Force and to remind the viewer that the Force is everywhere and in everything. He explains that the idea of a living Force creates broad connections throughout the history of the galaxy as well as the canon Star Wars stories as a whole. More specifically, he dives deep into the episode “A World Between Worlds” and says that the whole idea of this almost dream world was never about travelling through time, which happens in that episode; instead, it was to show new complexities in the Force. Filoni also mentions that though fans always want definitive answers about how things work in Star Wars, that wasn’t really the show’s aim. Much of what is left up to interpretation on Rebels was done on purpose. He just wanted to tell a great story and expand our views of Star Wars and the Force through this specific story of a young boy and his new family. The scope and insight of that featurette is a good glimpse into this entire Blu-ray set, which includes each of the 15 episodes in the fourth and final season and several other pieces of content. Most of that is geared at saying goodbye to this series, like the interviews with the cast members in the 27-minute “Ghosts of Legend” featurette; the 10-minute look into Kevin Kiner’s beautiful scores; the commentary tracks on six of the episodes, including the two-part finale; and the Rebels Recon series that dives into the making of every episode. Each entry does its best to illustrate where the show started, where it ended up, how it all tied together, and why it was as good a representation of Star Wars as we’ve seen since Disney took the reins in 2012. For example, Filoni explains that from the very beginning, he felt Hera and Kanan were an item and always leaned into that fact. That’s why fans so easily, and rabidly, viewed their interactions as such. However, they also had a job to do, and Filoni felt their relationship was better illustrated as a dichotomy between civic duty and personal desire, which is why it took until the final season for their romance to be front and centre. Basically, it was always there, it was just about getting it right, like everything else in the series. And obviously, fans will watch this release wanting to know what Filoni has to say about the end of the series, which wrapped up the story but also left a major cliffhanger, with a post-Return of the Jedi Sabine and Ahsoka Tano going off to find the missing Ezra Bridger. Filoni and his crew address the ending at almost every step of the way; however, in classic Filoni fashion, we’re told everything and nothing at the same time. At another point, Filoni says he found it interesting to send these two super-strong women off into the future and imagine what their adventures would be. Many of the stories he loved growing up didn’t just end, they restarted and “the ending presents a new beginning.” He teases that he knows when, or if, we’ll ever get that story, but of course can’t say. 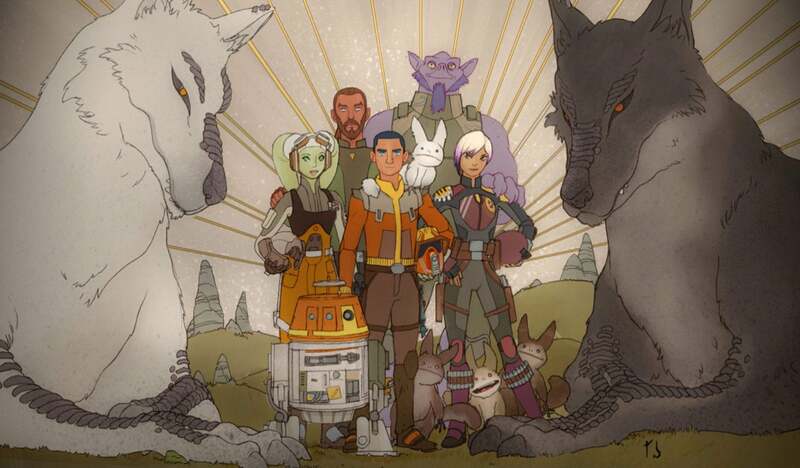 Instead, for now, we’ll have to imagine what happens next—and simply appreciate what we have in a complete, four-season series known as Star Wars Rebels. And if you’re a fan, this set will do just that. It’s not just a way to own these final fantastic episodes, it’s an ode to the entire series, a tribute to everything the series accomplished. Rebels is an essential part not just of the new Star Wars canon, but of what makes Star Wars so great. Which, these days, is something we can all use a quick reminder on.